Rita at Adventures in Tealand shared her analysis of a film I've been dying to see. The Tea Explorer follows Jeff Fuchs, who you might all know from Jalam Teas. It's not available in the U.S. but those lucky enough to attend the Toronto Tea Festival can catch a screening! Gabby at Tea End Blog traveled to Cameroon, a country that exports quite a bit of tea. As it turns out very little is actually consumed there. It took some searching but at long last Gabby was able to find some tea. I'm not one for watching most sports, especially football, but the Super Bowl is a game that I often wind up watching anyway. 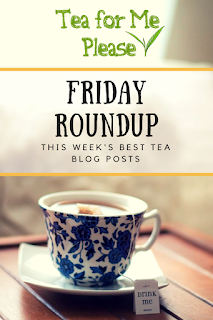 Sara at Tea Happiness posted some pairings that might help ease my pain a bit. Shou puerh to wash down the greasy snacks sounds like just the ticket. Jee at Oh, How Civilized put together a very comprehensive list of all of the best matcha spots in NYC. There are many of my favorites on here but also a few that I need to check out. My favorite place? Setsugekka. It's a must visit! Georgia at Notes on Tea took a thorough look at the Masters Collection offered by Adagio Teas. This a great post to check out for anyone who is considering these teas. Her takeaway echoes much of my own experiences. Gongfu may just be the way to go with some of these teas.